Destroyed health centre in Sakhour, east Aleppo, Syria, which, four years ago, provided 20,000 Iraqi refugees with health care. Today, the UN is looking into its rehabilitation. Following reports of airstrikes that damaged hospitals in northern Syria, two senior United Nations humanitarian officials today called for an end to such attacks. “The persistent and unceasing attacks on hospitals and medical facilities are one of the most egregious features of this war and have taken the lives of hundreds of medical personnel and deprived people in need of their most fundamental human right- the right to life. It must stop,” he added. The UN community is appalled by the ongoing damage and destruction of medical facilities in northern Syria depriving hundreds of thousands of people of basic health services, they said. According to the statement, on 25 April at dawn, the Shahid Wasim Husseini hospital in Kafr Takharim city was reportedly hit by airstrikes, putting it out of service. On 22 April, airstrikes in the area of Abdin in Idleb Governorate reportedly hit an underground field hospital and reportedly killed four civilians. Four other airstrikes impacting medical facilities were reported in April alone in this region, including a hospital specializing in maternal and child care. Almost all facilities were rendered out of service as a result. 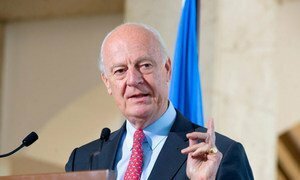 Speaking to journalists after a meeting of the Humanitarian Taskforce (HTF), Staffan de Mistura, the United Nations Special Envoy for Syria, stated that the horrific attack on a convoy of evacuees this past weekend had impacted everyone at today’s talks.